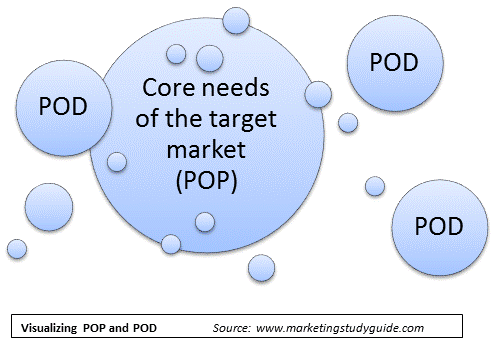 When deciding upon a brand’s/product’s positioning in the marketplace, the organization must ensure that end positioning has both sufficient points-of-parity (POP) and points-of-difference (POD). What this means is that you want the brand/product to be consider equal/similar (on par with, hence the word ‘parity’) with the major offerings in the category for the key attributes (POP), but the brand/product also needs to have a number of unique or differentiated attributes (POD). An appropriate balance is required for market success. Too much reliance on points-of-parity in the product’s positioning and it could be perceived as a ‘me-too’ product offering. And too little emphasis on points-of-parity and the product might be perceived as not meeting the core needs for the target market. You will note that both definitions referred to the offerings of competitors, so these terms are relative measures. And to clarify the word ‘aspects’; it refers to the various product features, benefits, brand equity, and other marketing mix elements (including price and place, plus any associated marketing mix elements of services). Typically, a firm decides the positioning of a product when it is either: entering a new target market for the first time or launching a new product into an existing target market. In either case, the product will usually need to win market share from established competitors (which is referred to as selective demand). For the product to win market share, it requires existing consumers in the marketplace to change their purchasing behavior. That means that customers who currently buy a competitive product will need to trial the new offering and/or current non-consumers need to be activated to purchase in the product category for the first time (which is primary demand). To achieve this goal of changing established purchasing behavior, the firm has both meet the core need of product, as well as bring something new to the marketplace. The following diagram demonstrates this in visual terms. As you can see, the large circle in the middle of the diagram represents the core needs of the market (points-of-parity) and the smaller circles represent new features or benefits (points-of-difference). One of the challenges for a firm launching a new product offering is to the extent that they differentiate the product. As outlined in the positioning section of this marketing study guide, one of the purposes of positioning is to simplify the offering in the minds of the consumer. As we know, marketing communication is a very competitive world and it is difficult to communicate many messages about a product, particularly low-involvement one. Therefore, as it is necessary to simplify the message, firms need be careful about overindulging in points of difference. 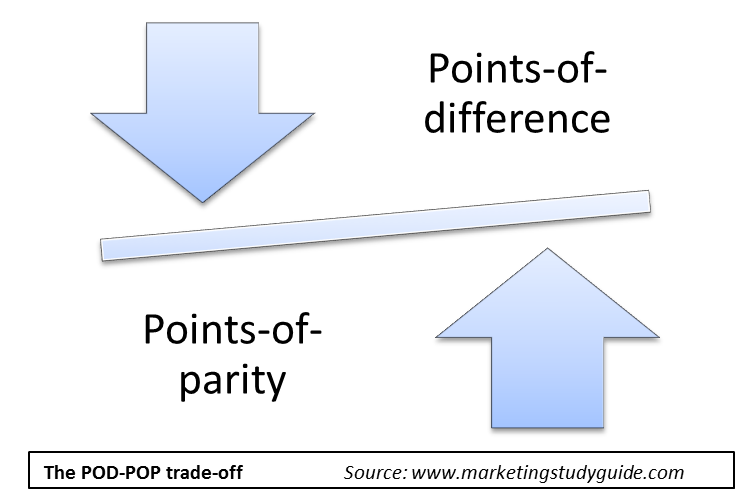 As shown in the following diagram, there is a distinct trade-off between the ability of the firm to communicate points-of-parity and points-of-difference. This is because consumers are likely to only remember a few elements about the product. .Ideally, an organization would like to communicate everything about all of their products, but that is just not practical given the interests of the consumer and the vast array of marketing messages being sent out. Therefore, firms need to strike an appropriate balance and to position the product within the product category as having sufficient points-of-parity, while highlighting one or two points-of-difference. The concept of a unique selling proposition (USP) has become quite popular in terminology in recent years. Essentially what this refers to is points-of-difference and you can use the terms interchangeably if required. A point-of-difference is basically what is different about the firm’s product, as compared to most competitive offers. The same meaning is applied to the term ‘unique selling proposition’; that is, what is unique (that is, different) about the firms offer. What to emphasize POD or POP? Continuing on from the discussion on the previous section, while firms do need to balance their emphasis between points-of-parity (POP) and points-of-differentiation (POD) there are occasions when a firm should more heavily emphasize one of these elements. The following table outlines the circumstances when a greater emphasis is required.